Fleta Quinn Farris, 83, passed away November 30 in Alexandria, Virginia. Fleta was born June 7, 1935, the youngest child of the late Guerry and Nettie Mae (Hall) Quinn of Hazlehurst. After high school, she lived in Jackson, Mississippi; New Orleans, Louisiana; Barbados; and Virginia. She married the late Stanley Farris in 1955. She returned to Hazlehurst in 1967 with her husband and two children, Melinda and Kenneth. When Fleta was growing up, she worked at Mitchell’s Drug Store in Hazlehurst. Later she worked in sales in New Orleans, started her own trucking company while living in Barbados, and was a receptionist at her son-in-law’s law firm in Virginia. Fleta loved adventures, especially meeting new people and traveling with family and friends. She always remained close to her older siblings, Cleo Reagin, Iley Quinn, Nadine Long, Lillian Moses, and Herbert Hoover Quinn, each of whom predeceased her. 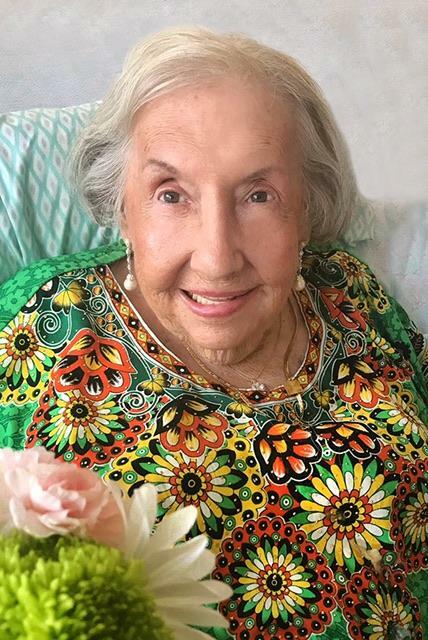 During the last few years, she lived at a nursing home in Alexandria, where she was editor of the resident newsletter and was crowned Miss Valentine. She is survived by her daughter Melinda Farris Weed and son-in-law Robert Ross Weed, and her son Kenneth Farris and daughter-in-law Connie Farris. She is also survived by and loved by many friends, extended Farris family, and surviving children of her five deceased siblings. Visitation and funeral services will be held Saturday, December 8, 2018, at Satilla Freewill Baptist Church. Visitation will begin at 11 a.m. and funeral services will follow at 12 noon. Interment will follow in the church cemetery. Miles Funeral Home in Hazlehurst is in charge of local arrangements.